TMC2208 is an ultra-quiet two-phase stepper motor drive chip, continuous drive current 1.4A, peak current 2A, voltage range 4.75V-36V, 256 subdivision. The flexible microPlyer interpolation unit provides up to 256 subdivisions, allowing perfect sinusoidal control even in systems with limited pulse frequencies; these are also designed because stealthChop2 ultra-quiet technology is widely used in 3D printing. Compatible with existing 3D printer electronics, eliminating the expensive costs of redesign. With a standard step/dir interface, it is easy to use. It can replace the original TMC2100, lower heat, especially for 3D printing market. ​ The TMC2208 outputs continuous motor current up to 1.4A and peak current up to 2A. 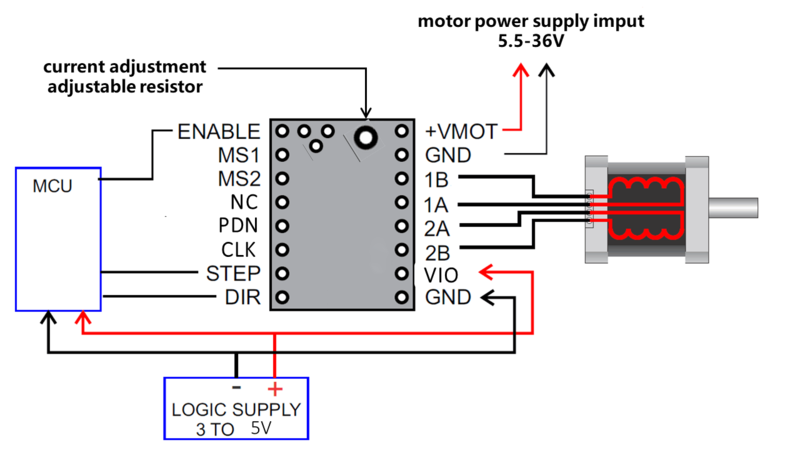 Therefore, the reference voltage of the driver module should not exceed 1V. At the same time, the driver module must be dissipated, otherwise it will affect the life of the driver module. ​ 1. 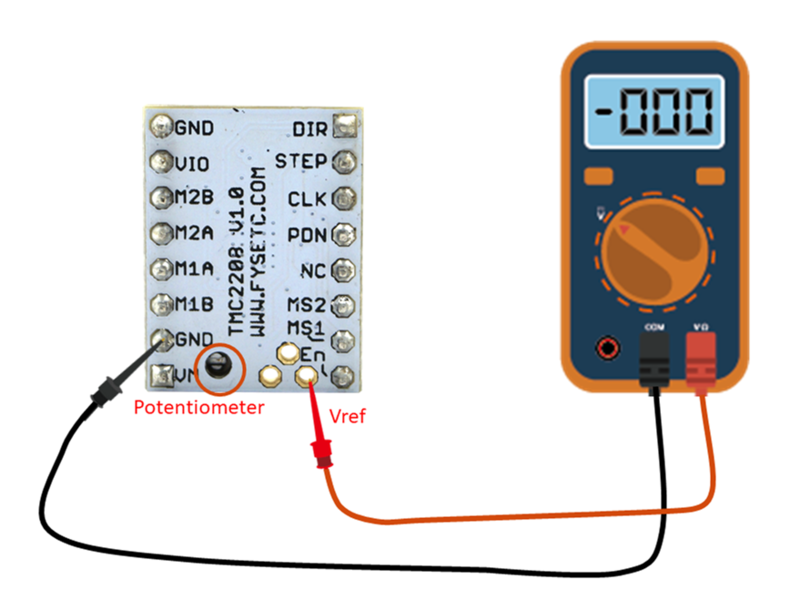 Vref measures Gnd and the voltage at the middle of the potentiometer. ​ 2. Do not connect the motor when measuring the voltage, otherwise it is easy to burn the driver. ​ 3. 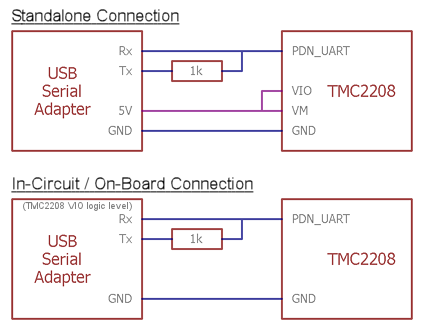 Power should be connected when measuring voltage, do not just connect USB power supply. ​ 4. Please pay special attention to directions! ​ The OTP bits can be programmed only one time. ​ If you enable spreadCycle then TOFF cannot be 0 (null). 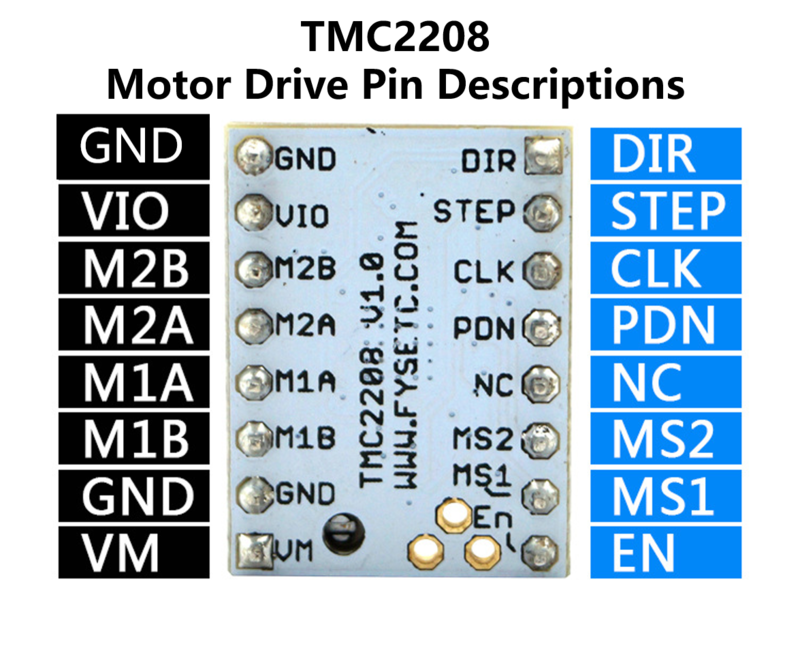 ​ The jumper next to the PDN_UART pin has to be closed on the TMC2208 SilentStepStick to enable the pin access via the pin header. V1.0 The default is standalone mode，If you need UART mode，you must config by yourself. 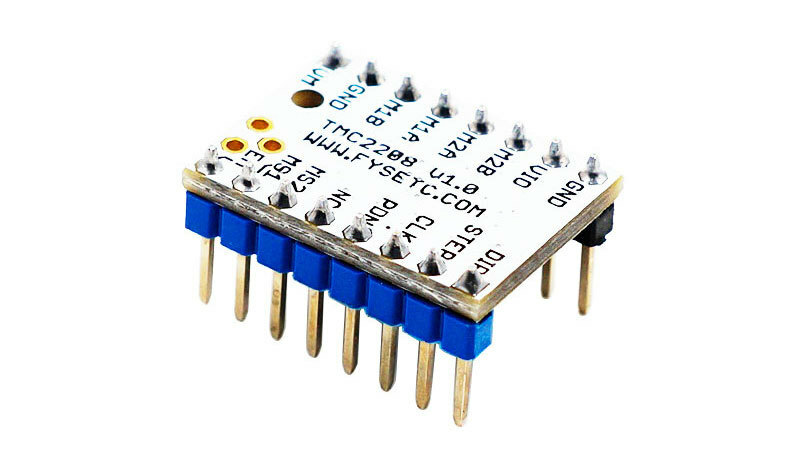 V1.2 UART mode, it’s used for F6.